Just a quick post for now to let you all know that the group (minus a few people who are doing more travelling) arrived home safely on Sunday after a long day in transit. Sorry for the delayed post, it's been a busy week getting back into the swing of things. Lots to process from this amazing, exhausting, complex trip, and I'm sure there will be more reflections posted in the coming weeks. Thanks again to everyone who supported this trip! One of the buildings in the Ancient City. Todays adventures began with meeting our new companion (tour guide) for the day, Jared. He lead us on a walking tour of the Ancient City of David and told us stories of the land as we sat melting in the 29 degree weather at only 9 a.m.
We went through a series of tunnels and caves starting with the Canaanite Tunnel, and continued our way through to the Hezekiah caves where we walked through freezing cold water (it was knee deep for those of our group whom are tall and waist deep water for the shorter ones like myself). Although it was cold, it was quite a refreshing walk considering it was a whopping 34 degrees outside! After we were done taking a dip, we went onto our final stop which was narrowly spaced Roman sewers. It was fascinated to go through these sites knowing that they were not tampered for over 2,000 years. It was a shorter day for us so after we visited the ancient city of David we got left of to choose our own lunches. A portion of the group went for the muslim traditional foods and others went towards the more modern foods. We had free time for the rest of the day to explore some markets or do whatever our little hearts desired, like getting some rest at the convent. Sorry that this post was a little delayed, but here is what we did on Monday. We woke up bright and early and said a thankful farewell to our host families. 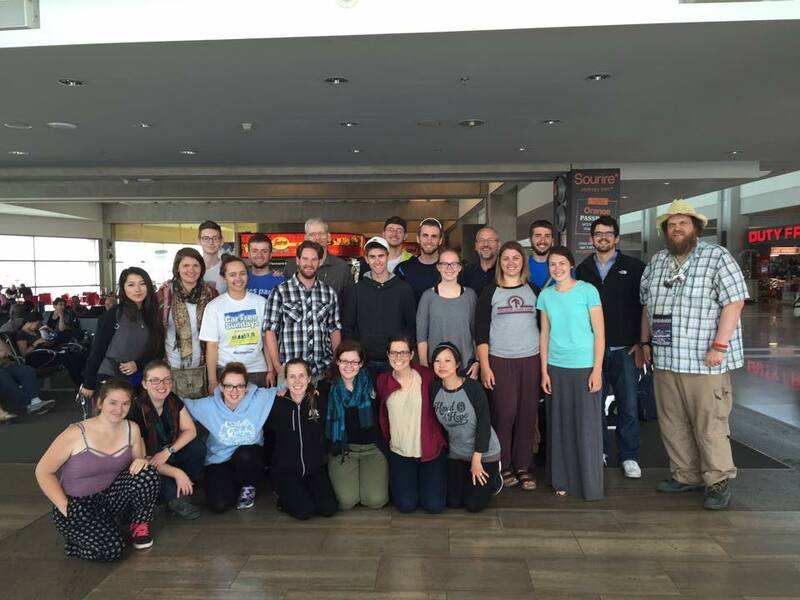 We then left Palestine and headed for Jerusalem, where we will spend our final week. Our first stop was the Holocaust Memorial Museum. The place was packed with information, photos, and personal stories of the hardships the Jews had gone through during WWII. It was all very moving, especially the memorial space made specifically for the 1.5 million Jewish children who had lost their lives. We then had lunch at the museum cafeteria and headed to the abandoned Palestinian village of Lifta. We had to walk down a slope quite a ways, and it was extremely hot but it was worth the sight. It was amazing to see the old buildings still standing with their original architecture. After snapping a few photos of the village we jumped back onto the bus and headed for a Convent in the old town of Jerusalem, which will be our home base for the week. The view is spectacular, the Dome of the Rock is literally a stone's throw away! We are ready to embrace whatever this last week has for us in store. Wow, today has certainly left all of us with a lot to think about (not that any of the others haven't). I apologize ahead of time for the lack of pictures in this post, but I think today was more focused on conversations and less focused on things that we were seeing. We spent today in the Jewish settlement of Efrat, where we engaged in conversation with people holding a wide variety of opinions and ideas regarding the current political situation. However as our guide said to us at the beginning of our day; "I know many, if not all of you come here today with baggage regarding the political situation in this country. We will not agree with everything, nor will you agree with everything that you are going to hear today. However my hope is that you leave here today with the view that we are people too, and that you will realize just how vastly complicated this conflict really is". I think I speak for everyone when I say that this goal was certainly fulfilled. Our first stop was at a school where we had the chance to talk with a rabbi and a couple of his students who will soon become rabbis as well. This conversation revolved largely around their study of Jewish law, and how Jewish law influences everyday life. I sound it interesting that rather than just looking at laws in terms of "thou shalt do this" or "thou shalt no do that", the students are constantly studying and debating the discourse and discussion behind the laws. this study is no small commitment either (the students that we talked to had been studying for 8 years!!). We were then able to sit down and have lunch with a number of other students from the school, further facilitating conversation around faith and tradition. A short bus ride later we were sitting down with another rabbi, this time diving head first in to the political situation. Interestingly enough, I think he delivered one of the most thought out peace narratives that we have hear so far. He believes very strongly in trying to form connections between Israelis and Palestinians, so as to break down the separation that has been growing stronger and stronger in recent years. He said that this segregation through creating the wall along with A, B and C zones, has been massively detrimental to any ideas of peace. This separation of people seems to have led to a situation where only the voices of the extremist few, on either side of the conflict, seem to be heard. The voices of the more moderate majority get drowned out by messages of fear and hate, which only lead to further separation and conflict. He also stated that far too many people do not have a good enough grasp of just how complicated this whole situation really is, which has led to many short term "bandaid" solutions. These short term fixes have only served to complicate the conflict even more because in the end, they do not address the larger issues. According to him, if any change is going to come, people will have to start thinking outside the box, and it will have to start with long term, grassroots movements. He used an analogy that really stuck with me, it goes like this; "A traveler asks an old man for directions on his journey. The old man told him that there are two roads leading to his destination. The first one is short, but it is very long. The second one is long, but it is very short. At the end of the day we split up and had the chance to have dinner with different Jewish families living on the settlement. I think this really hit home to everyone just how wonderful and normal may of these people are. This just adds another whole layer of complication to everything that we have seen and heard so far. It is so easy to sit on one side of the conflict and point fingers at the other side, to lay blame and leave it at that. But that is not nearly so easy when you have sat in their homes, eaten together and enjoyed each others company. We have to realize that while there are a number of political issues that we do not agree on, we are all human, and that is something that we cannot forget. There were a few other speakers that we heard from today, but I am limited in time and these were a few moments and thoughts that stood out to me today. "Oh Jesus, friend of sinners, open our eyes to the world at the end of our pointing fingers, let our hearts be led by mercy, help us reach with open hearts and open doors,oh Jesus, friend of sinners, break our hearts for what breaks yours". This really hits home for me, and I think also sums up part of the purpose for this trip. "Open our eyes to the world at the end of our pointing fingers", I think today was a big eye-opener for all of us. Everyone seems to want peace and freedom but have different ideas of how to attain it. Our first stop of the day was at Bethlehem Bible College. We heard an educated and very honest Palestinian perspective on the multi layered religious and political conflict. Palestinians "have been ignored at best and dehumanized at worst", the presenter shared about the problems with the Christian Zionist movement and how Palestinian Christians have been hurt. What an uncomfortable statement to have to process. Anger is an easy response to hearing of the injustice happening towards the Palestinians. Israeli's use four times as much water as Palestinians. Are you angry yet? unsettling yet very important experience. Resolving this conflict is beyond us, but we can stand in solidarity with the people of Palestine and never lose hope. After listening to the MCC reps and enjoying a lovely dinner with them, we crammed into a tiny bus with not enough seats, and feeling like sardines drove home for the night. Interestingly most of the graffiti on the Apartheid wall was in English, even if there were a few typos! In Palestine, today marks the anniversary of the day that Palestinians call the "Nakba", or the "Day of Catastrophe", and that Israelis call "Israeli Independence Day". It was around this time in 1948 that the State of Israel was created, forcing hundreds of thousands of Palestinians to flee their homes and become refugees in different parts of the world. In our conversations with both Israelis and Palestinians, we have learned of the complex emotional ties that the people have to this land. The writing in white are the names of abandoned Palestinian villages. The key symbolizes their wish to return to their homes. This morning we visited a refugee camp near Bethlehem, which was not at all like what I was expecting. Some Palestinian refugee camps have been established for so long that many of them have "permanent" housing (that is technically illegal) and a variety of social services such as weekly doctor visits, libraries, community centres and food banks. However, the residents of the camps are under continuous threat of eviction, as many have been. A selection of the amazing protest art in Palestine. In the afternoon we visited the Church of the Nativity, the oldest church in Christianity. It's been interesting to see the various peoples that have lived in this land reflected in the architecture; many structures are Ottoman built on top of Crusader built on top of Byzantine built on top of Roman, as the Church of the Nativity is. Sites that are said to be holy are especially contested, as different groups lay their claims to the holy land. To complete our Nativity pilgrimage, we waited in line for 15 minutes to descend into a crowded, damp grotto that is said to be the birthplace of Jesus. Some of us entertained ourselves by singing "The Virgin Mary Had A Baby Boy" as we waited. 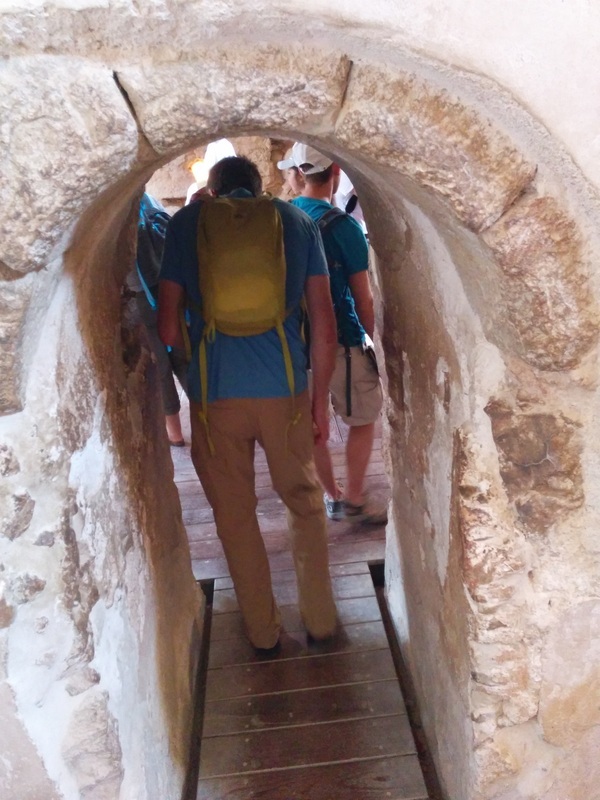 Many of us have been disappointed about the lack of women featured in the biblical sites we've visited, and because of this it has long been the ambition of many to visit the famed "Milk Grotto", right around the corner from the church of the Nativity. (For some reason, a high percentage of biblical events occurred in grottos. What even is a grotto anyway?!) Legend has it that Mary's milk fell on the stone, turning it white, and thus many have come to believe that the white stone of the grotto has special powers of fertility. A few hopefuls among us took the opportunity to really jump in to the mythic powers of the grotto. While there, we witnessed the Holy Sisters as they sang their prayers in Latin. Grottos have amazing acoustics. Some of the women of Yella 2015 in the Milk Grotto. No boys allowed. To continue the milk theme, some of us finished our day with coffee at Starbucks Bethlehem, a completely legal branch of the popular coffee shop. Since its been a while since we last posted we'll begin this post with a quick recap of the last couple days. We spent the day at an Israeli school called Oranim. There we listened to lectures about the recent elections in Israel, the origins of the Kibbutz system, and spoke with some students about life in Israel and their thoughts on Palestine. 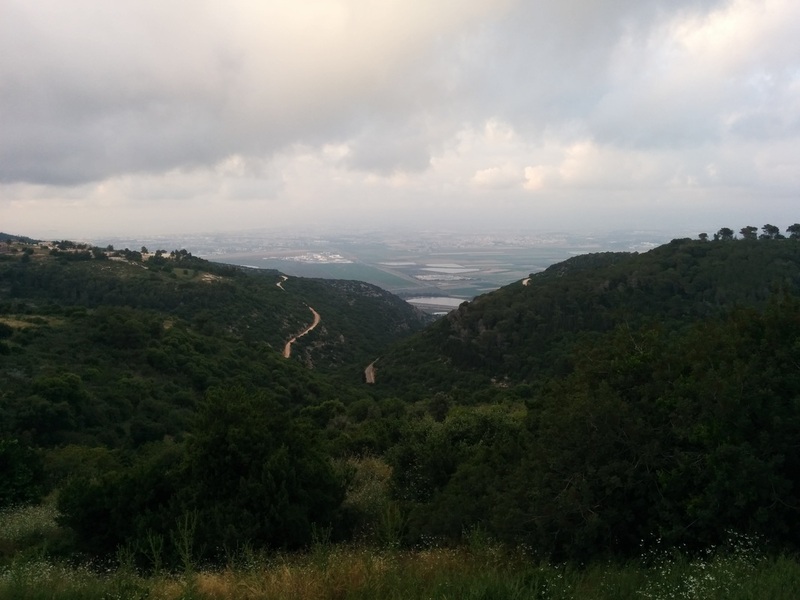 We left to grab dinner at a Druze restaurant located on the top of a mountain overlooking Haifa. They served us an excellent dinner that was only eclipsed by the view from our tables. For our second day with Oranim we spent our morning at the Ghetto Fighters Museum. The holocaust is always a heavy topic to learn about and our guide for the morning emphasized the true weight of the experiences of the Jewish people in that time. Our visit ended with an encounter with a holocaust survivor who spoke about his experiences during that time. We spent the rest of the day driving to the West Bank to meet with our host families. The group split apart to go to our new homes for the rest of the week and we experienced more true hospitality. The day started with a long drive to the Dead Sea region in the south. After a few hours on the road we arrived at Masada and took a short cable car ride to the ancient stronghold overlooking the Dead Sea. We learned about the Jews who captured it and lived there for 7 years before the Romans took it over. I could barely fit through the doors. Herod must have had a short architect. After standing in the heat on top of a mountain we went to cool off in the Dead Sea. Floating in the Dead Sea was an experience that doesn’t lend itself to explanation. Someone commented that it didn’t actually feel like we were “swimming” in water. We ended or day with another short cable car ride to the top of the Mount of Temptation and dinner overlooking Jericho. On our way home we stopped to look at a monastery and instead beheld the beauty of the wilderness. Finally we get to the events of today. 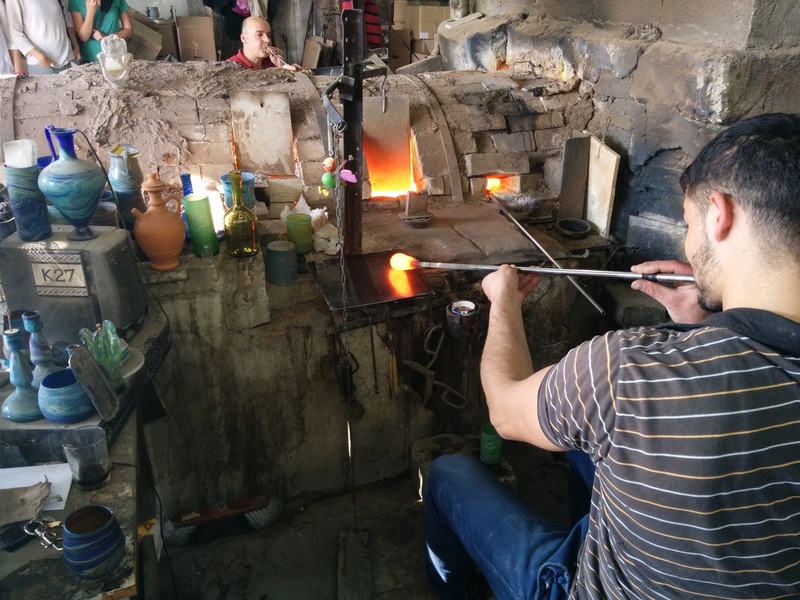 We drove out to Hebron and made our first stop at the Hebron Glass Factory. There we watched how glass cups, candleholders, and vases are blown and some of us got to try blowing glass ourselves. We then drove deeper into the city and left the confines of our bus to walk through markets. Our goal was to reach the CPT (Christian Peacemaker Teams) apartment near the old city. On our way we spoke with a Palestinian who invited us into his home to see and hear about his experiences with the Israeli Settlers. It was at this point that our time in Israel/Palestine took a turn for the serious. 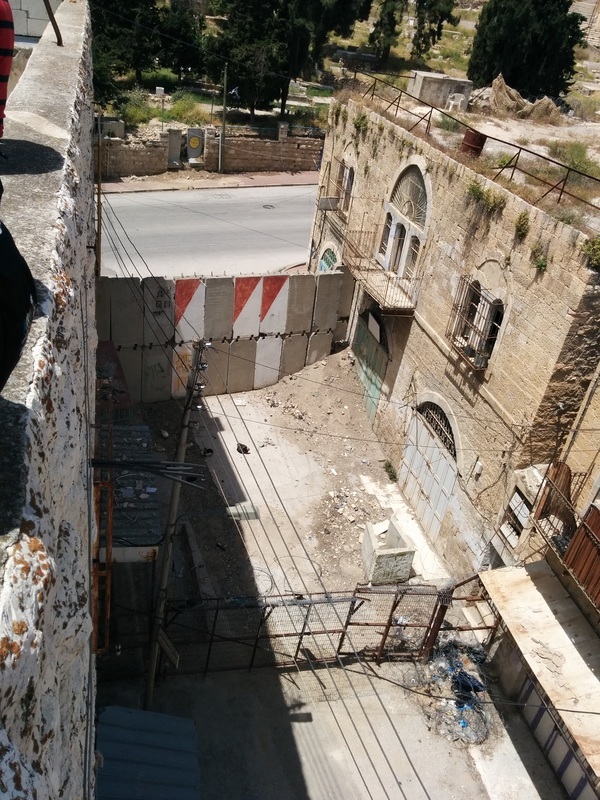 We went to his roof and were immediately confronted with the reality many Palestinians face. A settler building was a mere stone’s throw away, towering over his own. He spoke about his daughters having bottles thrown at them, and he showed us video of an Israeli Settler trying to climb onto his roof. Suddenly the fencing and barbed wire on the perimeter of his roof made sense. After we left we walked down a street with fencing and bars above it to stop settlers from throwing trash on the Palestinians below. Eventually we reached the CPT building and spoke with the people there. The CPTers spoke to us about their advocacy efforts, their work walking children to school, and their actions in documenting what goes on in the city. They took us up to the roof and we looked at the various bits of the settlements we could see and watched settlers and soldiers walking by on the Israeli-only street below. We heard about the various actions taken by the settlers to force Palestinians out of their homes and keep them off balance and afraid. A view from the roof of the CPT apartment towards the Israeli controlled street. We entered the Israeli controlled section and had our lunch at a rooftop restaurant run by a Palestinian family. I’m still not sure how that works but it did reinforce the fact that very little about the situation here makes any sense. We left lunch to visit the mosque where the remains of Abraham and Sarah, Isaac and Rebecca, and Jacob and Leah are said to be buried. 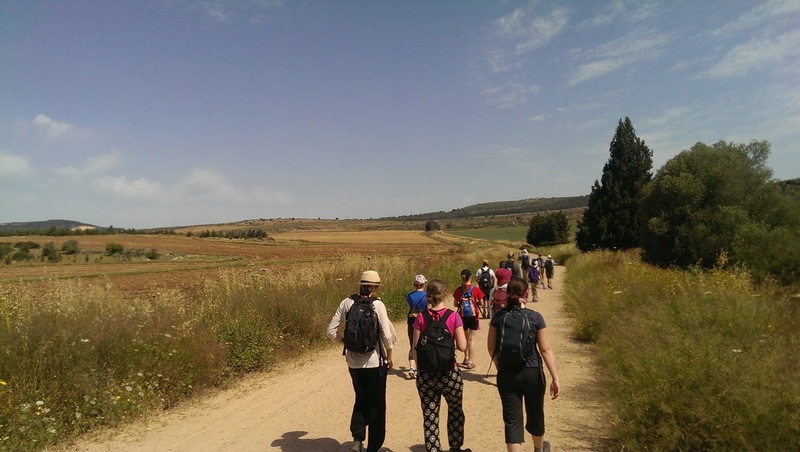 We walked back to our bus through the city and left to visit the town of alTawani in the south Hebron hills. In the village we heard someone speak about the Palestinians resistance to Israeli efforts to evict the Palestinians and demolish their homes. In this town the Italian organization Operation Dove has been helping the people with their resistance efforts. After spending a week travelling around Galilee and the Jezreel valley, going through the West Bank and Hebron has lifted the veneer of this place. 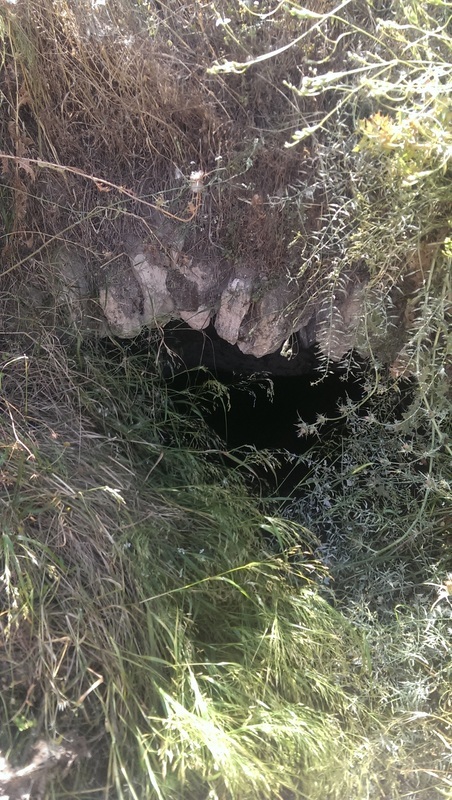 We saw the tourist sites and the beautiful landscapes, but now we have seen some of what lies beneath. There are amazing and kind people who live their lives limited by military checkpoints and the whims of soldiers who can stop them and demand their papers. There are sections of the land that have been settled by people who call them names, throw stones, and sometimes shoot at them. There are so many people on both sides of this conflict that want there to be peace but have had so many barriers put up to stop them from working together. In this last week and a half this group has had a privilege that very few people here have, we have been able to go visit and see the all the places in this land. When Israelis are not allowed into Palestinian controlled sections and Palestinians are not allowed to go to the Israeli areas (or Israel itself) these two peoples can’t even speak to one another. How is there going to be peacemaking when those in conflict can’t even interact? The view from our home stay. 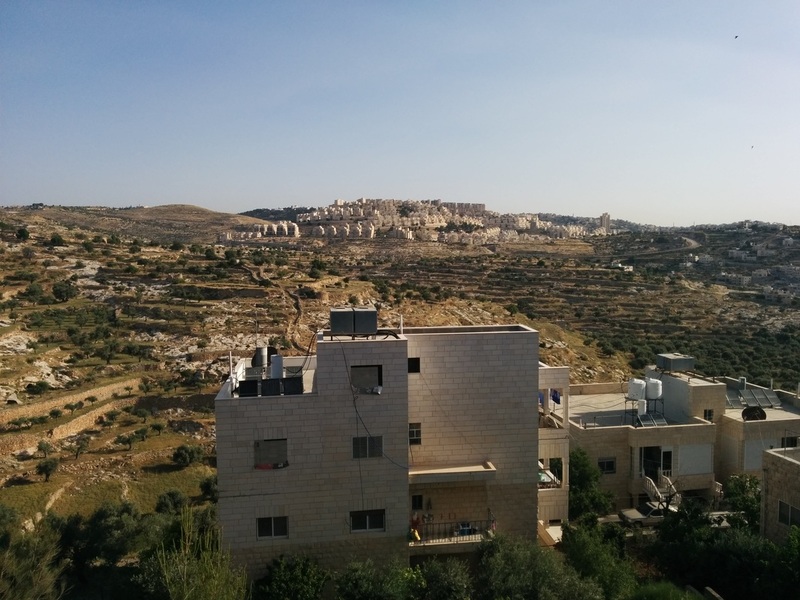 You can see an Israeli settlement on the next hilltop. We started our day yesterday, got up, ate breakfast then set out for our amazing hike. It started just like all the other days here.....hot!! We walked and walked one person after the other. We went up and down the rolling hills of Israel. As many of us appreciated we would stop under and shaded tree for a break and some water. We continued walking to our lunch spot which was a camp ground. There we ate Nutella and banana on a pita with snacks on the side. As we continued walking we went through a great field of wheat that reminded many of us of the landscape back in Canada. After walking through that field we continued to just at the base of where we would stay for the night. We stopped at a underground cave that was hidden in some thorns. We went inside and found an ancient olive press and many other rooms. After that adventure we went on to where we were staying for the night. 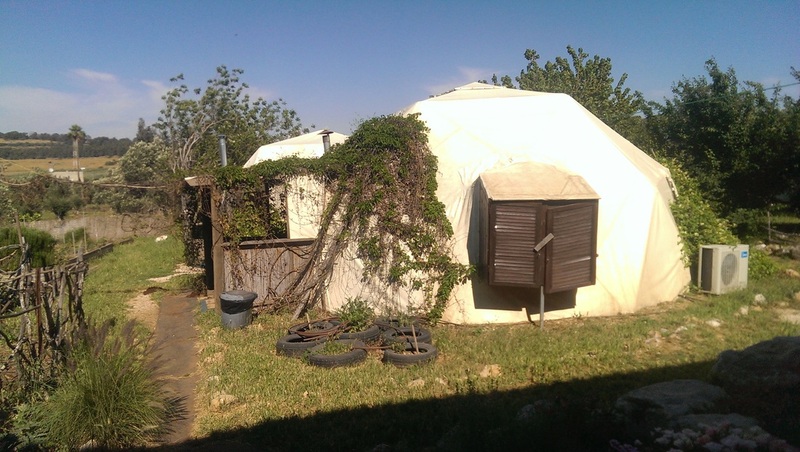 We stayed in a goat farm for the night called Yarok Az. They had a swimming pool which was amazing after a long and hot day of hiking. We then set our stuff up for the night in our tents. Once settled we ate dinner together of salad, chicken, soup and vegetables After our wonderful dinner we had a large group talk about what we had done and what we had felt about the day. After everyone had had their turn we all either went to sleep after our long day or played games together. Once after we were all tired we got ready and went to sleep. After a much needed sleep we ate a delicious breakfast of scrambled eggs, toast, and cereal we took off. today was hotter than the day before. As we hiked there was much conversation about the up coming day. 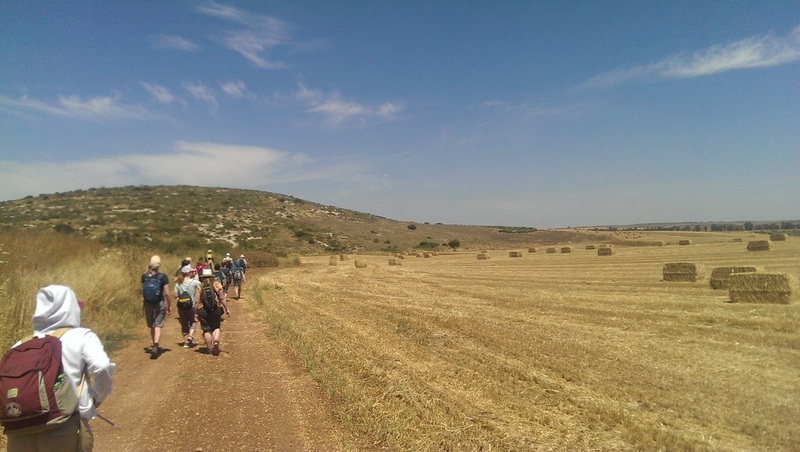 As we walked we began to see our objective, The Horns of Hattin. As we looked on we saw a gigantic and beautiful hill infront of us. We walked and walked and walked and finally made it to the top. We took a break up there and looked at the beauty surrounding us. We all stood there in awe of all the beauty. We then made our way down from the horns and made our way where the bus was going to pick us up. After meeting the bus we went to have lunch of peanut butter and banana sandwiches at a religious site. 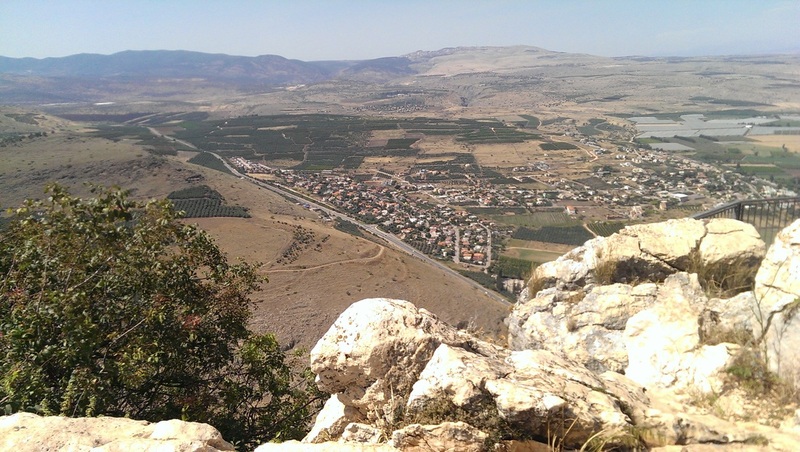 We then got on the bus that took us to the top of Arbel. 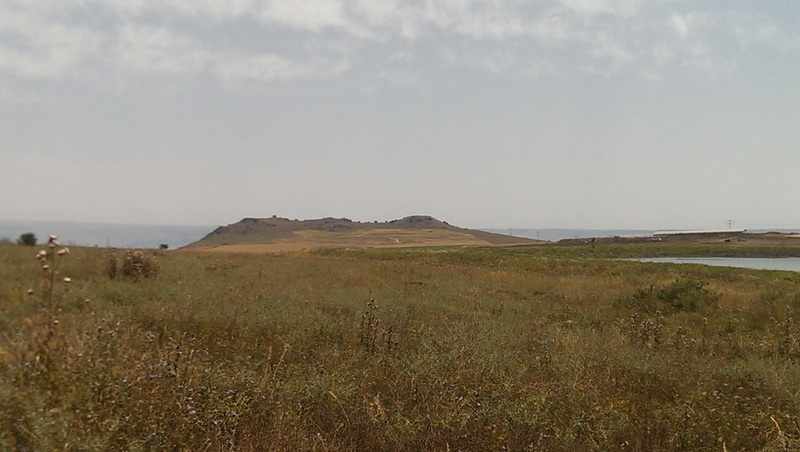 This is where the Romans fought the Zealots. We started at the top of the cliff and made our way down. As we were closer to the bottom we say the Zealot hold outs in the rock. The cut into the rock for protection. This was amazing to see and think about living in that rock. 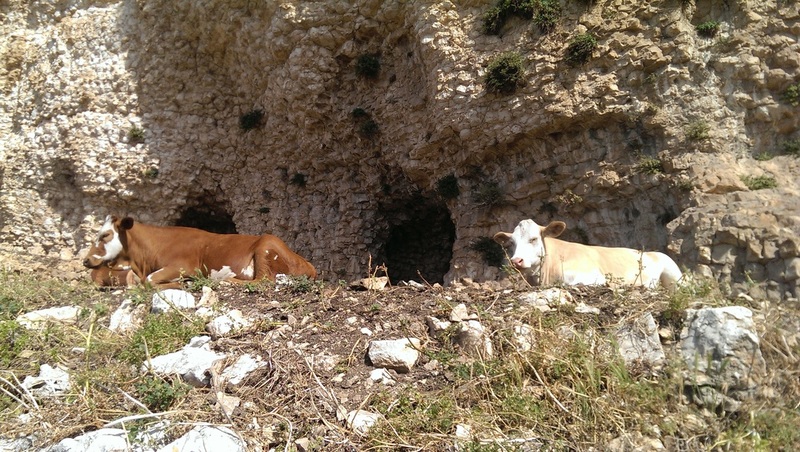 Amazingly now the caves in the rock were now inhabited by cows. It was so stunning and really made you think about how small you are in this huge world. After we made it down the incredible hill and saw all the beauty. We made our way to the bus that was waiting for us at the bottom of the hill. We all got into the bus hot and exhausted which lead to a very quick bus ride back to our hostel. As we got into the hostel we all right away ate our dinner and had a much needed shower after trying day like that. All that is left is to get ready for the next day and wait and see what God has in store for us. Today has been one of our busiest days so far. It has been filled with curiosity, hot temperatures, shawarma, and some fascinating sites. This morning we left the Inn at our earliest time yet, 8 AM. We took our tour bus (whose mirrors look like bunny ears) and journeyed to magnificent Sea of Galilee. Our first stop was at the Ginosaur museum where we saw their one and only exhibit, a first century fishing boat. The restoration process was very interesting to learn about. In addition, the bigger mystery of who used the boat made us all wonder. After the museum we hopped on the "Sea of Galilee Worship Boat". We cruised the sea and got to listen to some worship music selected by the captain of the boat. It was a fun and silly experience. 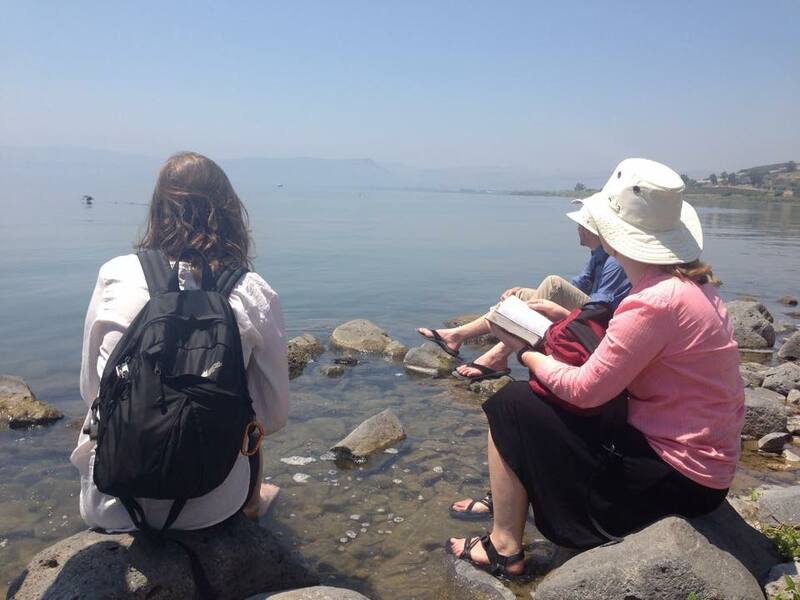 Our Worship Boat docked in Capernaum where we ventured over to see Peter's mother's house, synagogue remains, and we dipped our feet in the Sea of Galilee. Next we were off to lunch where the majority of the group had shawarma. A delicious meal that re-energized us for the heat of the afternoon. The Church of Heptapegon. 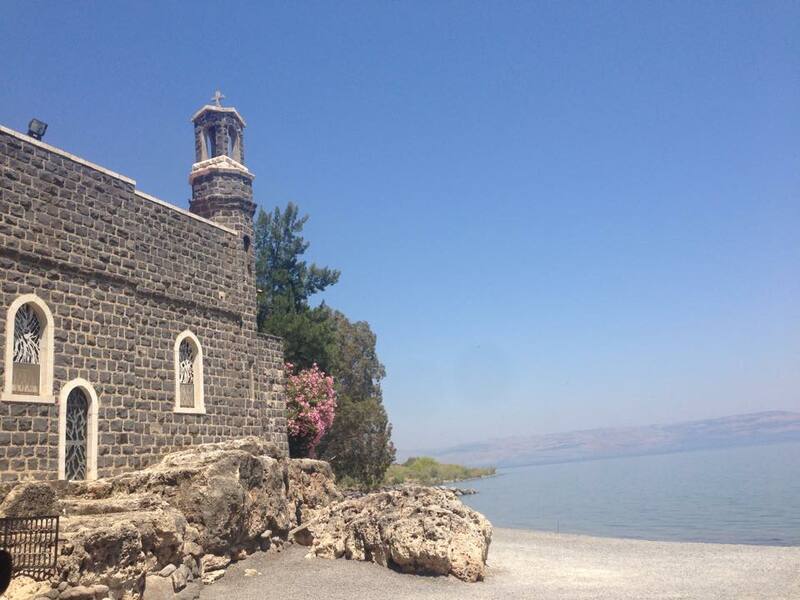 This site is where it is believed that Jesus multiplied the loaves and fish for the 5000. The mosaics of this church were stunning. Continuing on with the church theme we visited a church that remembers Jesus' breakfast with Peter after his resurrection. We re-listened to the story of Peter following Jesus after his resurrection and the implications of this choice. The water here was beautiful and many people took another opportunity to wade in to the Sea of Galilee. On a more humorous note, throughout the telling of Peter's story, a very loud party boat was passing by. The music they were playing and the story did not quite match but added some comic relief for the group. Walking across the road from the church, we climbed the mountain there to a gathering point beneath a large tree. 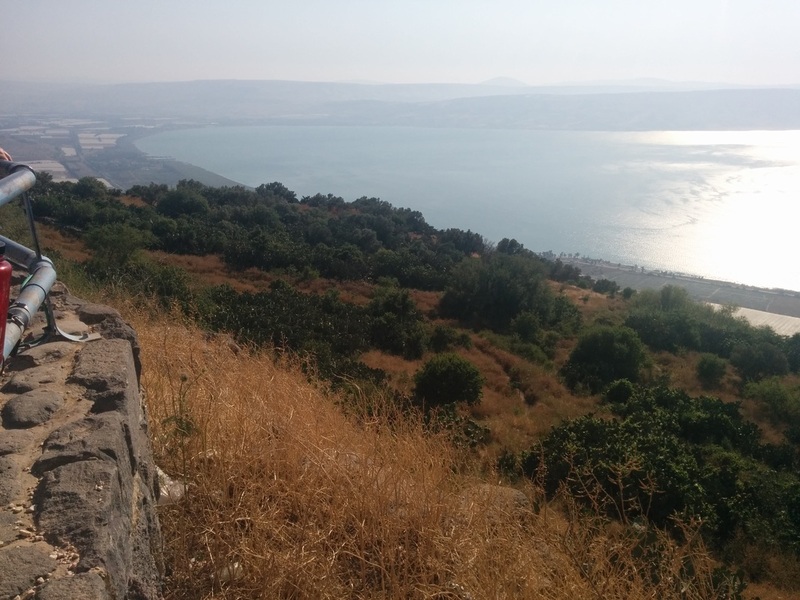 Our view overlooked the Sea of Galilee and looked over to where Tiberias would have been in the Golan Heights. It was up here in the scorching heat that we studied the Beatitudes. We now look at this story from a different perspective when taking geography into account. After our hot hike up to mountain we were happy to go back onto our air conditioned bus and drive to a sacred place in the Decapolus. Here we climbed a bit of the mountain. Some of us went down in the crypt and held a bone we found down there. Our last stop before returning back was the Magdala Center. 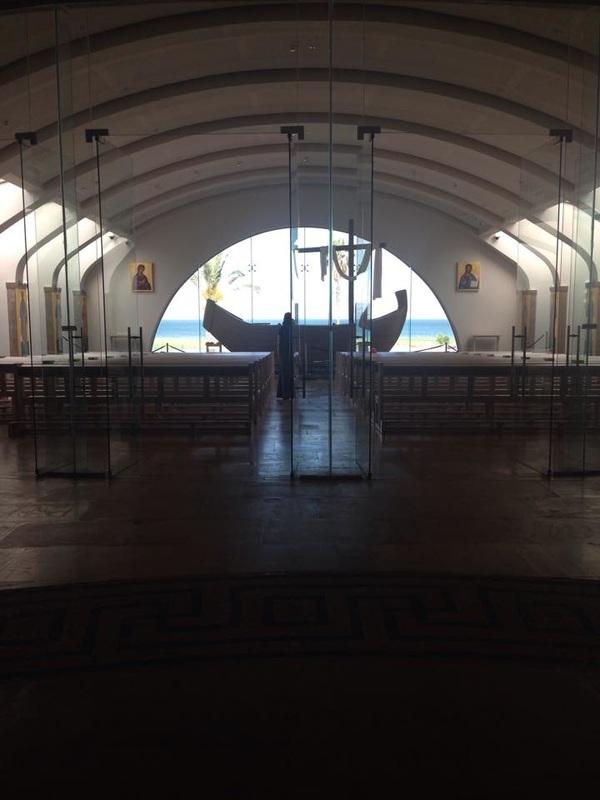 There was an archeological site there and a beautiful church. The view from the pews was incredible and some said it seemed like a picture. We had a worship service as a group there before heading back to Nazareth for dinner. We are now cooling down at the beautiful Fauzi Azur Inn. In true Mennonite fashion we have a game of Dutch Blitz happening, while others are choosing to hang out in the roofless patio/lobby. Today was a great day and we're looking forward to the adventures of tomorrow!